Toy Drone and Car; Ground to Air Combat! 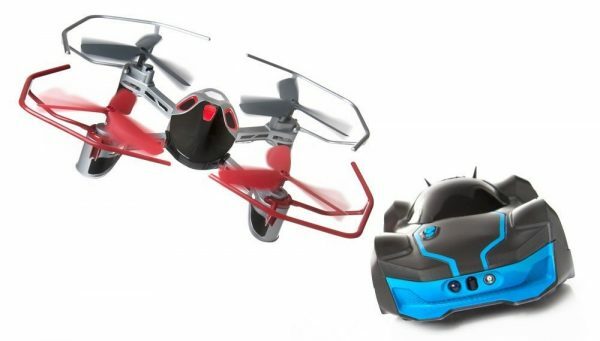 This toy drone and car set will give you total ground to air combat! Whether you choose to challenge your friends, or take on a legion of ruthless computer-controlled A.I. Drivers, you can play almost anywhere indoors with no need to set up a track. Pick a side and enter the game. Simply download the R.E.V. Air app on your BLE smartphone or tablet and take command of either vehicle. The R.E.V. Air battle pack includes 1 Drone and 1 Car for true Ground-to-Air Combat. Get behind the wheel of the car and battle against the quadcopter from the ground…or become a pilot yourself where your mission is to take out your opponent from the sky.